Accept Credit Cards Online with An Ecommerce Merchant Account. Merchant Account vs. Payment Gateway: What's the Difference & Which Do I Need? 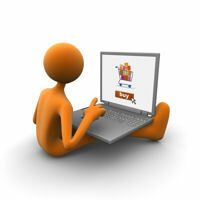 Ecommerce Merchant Accounts - Accept Credit Cards Online! Ecommerce merchant accounts are known as Internet Merchant Accounts or MOTO Merchant Accounts and allow businesses to sell products and services online from a website or ecommerce store. If you have a retail business with an existing retail merchant account and wish to begin selling online, you will still need to get an ecommerce merchant account since retail merchant accounts require a card-swipe and using a retail merchant account for ecommerce sales can result in termination of the account. However, because ecommerce merchant accounts are also used for mail order and telephone order (MOTO) sales, in addition to enabling online ecommerce sales, merchants can also accept credit cards by phone and process other "card-not-present" credit card transactions. In addition to an ecommerce merchant account, to accept credit cards online or by any other card-not-present method, you will also need an Internet Payment Gateway which will connect to your website or ecommerce application to securely transmit the transaction data to the processor. The payment gateway should also have a virtual terminal which enables merchants to manually enter credit card transactions into a web portal for orders by mail, phone, fax, and mobile device. If your business is involved in "high-risk" transactions such as BitCoin, nutraceuticals, online gambling, software downloads, adult entertainment, online technical support, and MLM, High Risk Merchant Accounts will most likely provide the best solution for accepting ecommerce credit card payments since standard ecommerce merchant accounts do not support high risk merchants. Regardless of whether you're an established merchant looking to add an Ecommerce merchant account or a new merchant just beginning to sell online, you should work with an experienced ecommerce merchant account provider like CyoGate that has expertise in effectively securing and handling ecommerce merchant accounts.